I’ve worked in many organisations, large and small, public and private. The factor which I’ve noticed is common to the most successful and fun organisations to work at is a willingness to genuinely welcome suggestions for change from staff/customers and implement the best of these suggestions swiftly. Accept that some changes may be costly and unsuccessful because the risk of apathy and trying nothing new are far worse. Failure is an essential part of the learning process and the path to success. Accept that failure is OK, that some amount of failure is just the cost of doing business, and in fact, if you see it as I see it, failure is not a step backwards or time wasted, instead, it is a step forward and a lesson in what works and what doesn’t. Ultimately, the more successful you are, the more comfortable you’re bound to get and the more you risk losing your drive. Your mistakes and your failures are what force you to strive to better yourself everyday, and nothing is more valuable than that. Make your life simpler by not worrying about what you’re doing wrong. Instead, appreciate the value of your failures. It’s really easy to get in a routine and do work without questioning if it can be done faster, better, cheaper etc. Shake yourself out of this lethargy and start considering ways to make changes for the better in your work processes. Organisations and people who stick with the current ways of “doing things as we’ve always done them” are risking competing forces outflanking and crushing them. The actions of just one person can help make huge changes. In large bureaucratic organisations both public and private, suggestions for changes and improvements from staff are often seen as bad news by bosses and get buried so that managers never hear of them. However these same bosses like to make the impression that they welcome new ideas for change so it’s quite likely that somewhere in the organisation there will be a customer suggestion box or a suggestion form on the organisations website. Submit your ideas and suggestions anonymously so bosses think they came from customers. If written make sure you use different handwriting to your normal style. Your organisation needs to change from the slow and ponderous ocean going freighter which it’s like at present to become like a powerful and fast gunboat which can react quickly and effectively to changed circumstances. Netflix.com is one of the most successful web sites in the world: the sole customer interaction point of their home DVD-rental business. Over the past 9 years, the site has grown from nothing to serving almost 6 million customers who use the site to prune their rental queues, rate movies, and handle any billing and transaction issues. The designers of Netflix.com have a smashing success on their hands, but we didn’t find them resting on their laurels. They want to get even better, and for them that means iterate, iterate, iterate. Fail Fast – Failing fast means you invest less time in the things that don’t work. Reactivate your drive to succeed by looking for ways you can improve the way you and your organisation work. 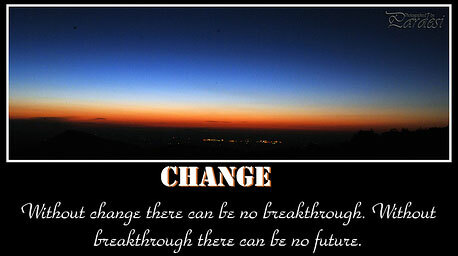 The only safe place in life is continuous improvement and change, and I believe the same can be said for businesses. Breaking the status quo is great. But not just to be different; you have to have found something truly better. It’s just as dangerous to get caught up in continuously planning changes than it is to plow forward with a derelict system. There needs to be balance; you’re actively looking to improve the workplace, but realize that good changes (like automating tedious tasks) aren’t worth it if the tasks need to be performed so infrequently that the time and expense to implement an automated system is far greater than keeping the status quo. Of course if I’m working on my own, I’d go the long path anyway, because it’s more creative and interesting than performing tasks meant for computers. The Culture of any organisation is always always, symptomatic of the Leader. The more visionary the leader the more open to change, the suggestion/pace of change within the org. I have found this in many orgs I have worked for. Now the funny things is, Now that I am running the show..WHAT type of a leader will I be?? ?